Do you have a need for a Halloween vocabulary in Spanish words? If you are an ESL or bilingual teacher, this article has Halloween words in Spanish and resources for you. Word Search Fun.com is a good site. You have to sign up but it is free. You can make a puzzle using the words you choose. It is quick and easy. Puzzlemaker at Discovery Education has word search puzzles and crossword puzzles that you can make. Boggles World ESL has a Halloween word search, a flash card game with Halloween words that help with grammar, and a PowerPoint Halloween story. ProProfs.com has 25 Halloween flash cards with the English word on one side and the Spanish word on the other side. They can be printed out and used in your classroom. Ed Helper has 17 stories in Spanish about Halloween for grades one through seven. However, to print out the stories you have to join edhelper.com, and it costs $20 a year. Now that you have a list of Halloween vocabulary in Spanish words and some resources, let look at the two holidays celebrated in the United States and Mexico at the end of October. The Day of the Dead, or El Día de los Muertos, is similar to Halloween in that it starts on midnight on October 31st and has to do with the dead. Common customs include making altars in the home for the dead and decorating their graves. However, the origins of the two holidays are quite different. Let's look at the origins of these two days. The Day of the Dead is about remembering those who have died. The celebration lasts until November 2nd and is one of the biggest holidays in Mexico. Its origin comes from the Aztecs, who observed a month long celebration in the summer that was presided over by the goddess Mictecacihuatl, who is called the Lady of the Dead. Later, when Catholicism became the main religion in Mexico, this celebration was merged with All Saint's Day on November 1st. 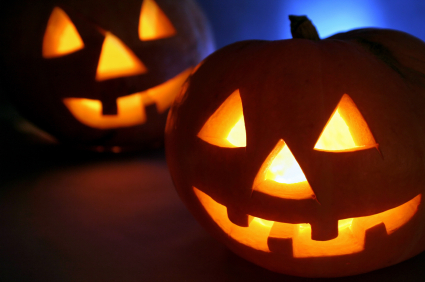 The American holiday of Halloween started with the Celtic people in what are now Ireland and some surrounding areas. Their New Year started on November 1st and it was believed that on October 31st, the worlds of the living and dead became blurred and the ghosts of the past dead returned to earth. One good thing about the day was that the Druid priests thought they could better predict what would happen the next year when the ghosts were around. The festivities included bonfires, animal sacrifices, and wearing costumes. When the Romans conquered the Celts, they combined this celebration with two of theirs: Feralia, when they remembered the dead, and a day to honor the Roman goddess of trees and fruit, Pomona. By the 9th century, the Catholic church designated All Saints Day as a day to remember saints and martyrs, and it was celebrated on November 1st. It was also called All Hallows, and eventually the night before became All Hallows Eve, and then, Halloween. "Halloween Vocabulary in Spanish." YourDictionary, n.d. Web. 19 April 2019. <https://spanish.yourdictionary.com/Spanish-language/learning-spanish/halloween-vocabulary-in-spanish-words.html>.